At the outset, it would appear that reviewing three CDs of solo piano music from keyboardist Rick Wakeman would be a daunting task. While wrestling with the perception that the pianist can easily sit down in an afternoon and knock out an album's worth of material, one wonders how many ideas will be unique, merely built on his flashy playing style, or if the output has merit, taking into consideration that it was created instantly. Disc One is entitled The Past, which implies that he is revisiting his older ideas and previous approach which helped to get him to where he is today. 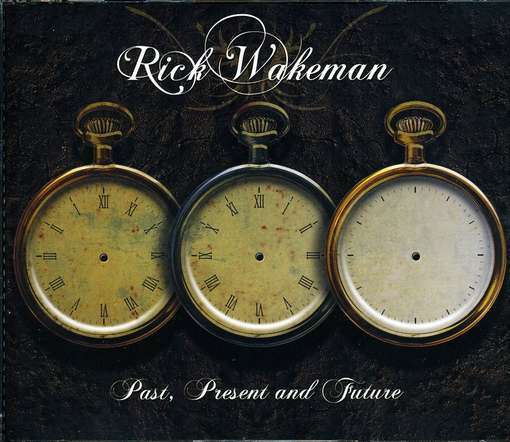 No doubt, Wakeman's poise and spiritual persona comes through on several pieces, especially on the calming "Once upon a Time" and "Ice Age," where phrasing and major chord changes intertwine with familiar but distinct melody lines. What makes this different from the remainder of Wakeman's vast catalog is the degree of composure and calm present in the performance itself. He navigates the ivories with care and confidence that could only have been achieved through suffering, practice, and personal reflection. He stays within clearly defined melodic parameters without sounding grandiose on pieces like "To Those We Loved" and "Eden." In contrast, the thirteen tracks of The Present are anchored in the here and now, but they are equally contemplative. A few of the best melodic ideas include "A View from Above," "Circle of Time," and "Living the Dream." The former piece leads with a precious descending passage before entering a romantic theme. The latter track has less dramatic phrasing, which would make it suitable for a missing vocal line. Rick's playing has become substantially more economical over the years, not because he's slowing down, but because his compositional choices are more in service of song structure and less in service of style. The third disk, The Future, has some themes that can almost be considered weepy, like "A Galaxy of Light" or "A Second Chance," and some that are emotionally outreaching "Into the Unknown" or "The Final Journey." Wakeman easily sidesteps the new-age label, since most of his songs and his playing push the listener beyond a comfort zone into a personal search. It's also important to clarify that each individual set of tracks can stand easily on its own or together with other pieces in the collection. It’s obvious that Wakeman's well of ideas is far from empty.